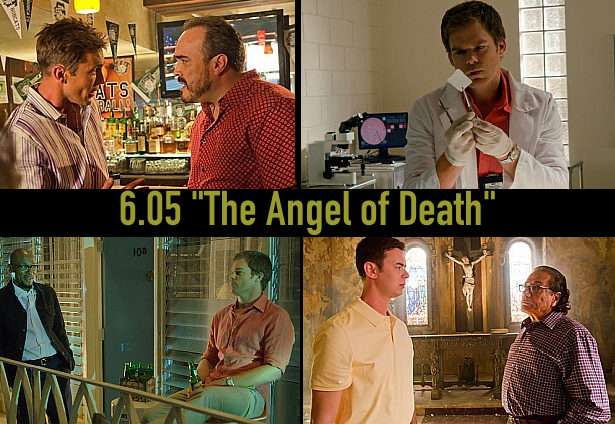 Tonight: the re-run of the fifth episode of season 6 "The Angel of Death" on Showtime. The episode was written by Scott Reynolds and directed by SJ Clarkson. With the help of his newfound friend Brother Sam, Dexter wonders if there is light within him to counter the darkness, while the search for the Doomsday Killers takes him in a new direction; Batista and Quinn pay a visit to the university where Professor Gellar taught; due to departmental regulations following the shooting, Debra is forced to begin therapy. Refresh your memory by watching the promo below and find everything about the episode here. Way to overuse the "Hello [insert name]"
Hello Dexter Morgan, Hello Dexter Morgan, Hello Doomsday Killer, etc.